Last month, a Michigan woman named Yvette Cormier complained to the management of the Midland Planet Fitness gym after she saw a transgender woman named Carlotta Sklodowska using the women’s locker room. When management informed Cormier that transgender members were allowed to use the locker room of their choice, Cormier spent four days approaching other women at the gym and informing them that a “man” was using the women’s locker room. Planet Fitness asked her to stop. When she refused, the gym cancelled her membership, stating the she had violated the company’s trademark “no judgment” policy. ABLOW: It’s tough to speak about because we’re so politically correct now that we get tongue tied. We can’t say the obvious, which is this is craziness. You’re kicking out members because they feel uncomfortable that someone who seems to be a man to them and is genetically is looking at them naked when they’re unclothed as women? That’s craziness. Contrary to Ablow’s assertions, there’s no evidence that Sklodowska was “looking” at other women in the locker room naked. Sklodowska, who reportedly used the gym twice as a guest of another member, claims she was only using the locker room to store her coat and purse while working out. And transgender people aren’t delusional or pretending – major professional medical organizations, including the American Psychiatric Association and American Psychological Association, recognize transgender people as real and deserving of respect and acknowledgment. Ablow, on the other hand, has demonstrated no expertise in issues surrounding gender identity. 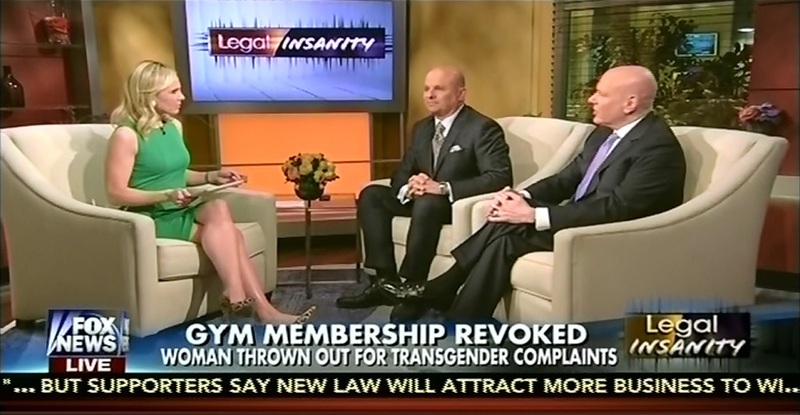 Fox’s fearmongering is part of a broader “conservative assault” on transgender access to places of public accommodation, based largely on the thoroughly debunked myth that men will sneak into women’s restrooms. It’s a scare tactic that ignores the fact that transgender people are actually the ones most at risk for being targeted and harassed in public restrooms.